Confirmation classes will be held at 10:15 a.m. Sunday, January 13 through April 15. Confirmation will be Sunday, April 28 at 10:00 a.m.
Beginning Sunday, January 13, a series of 12 classes is being offered to adults and youth who wish to make a public affirmation of their faith by either being confirmed or received into the Episcopal Church and for those who wish to reaffirm their faith. The first three classes were “The Anglican Ethos” on January 13, and “Wild Water and Full-Body Prayer: Rituals in the Episcopal Church” on January 20 and 27. Additional topics to be covered include how the Episcopal Church works, what we believe as Episcopalians, our liturgy and music, The Book of Common Prayer, and the sacraments. The remaining nine classes will be held in the chapel on Sundays at 10:15 a.m. (except for February 3, the day of the Annual Meeting, and Easter Sunday, April 21) in conjunction with classes for youth confirmands. 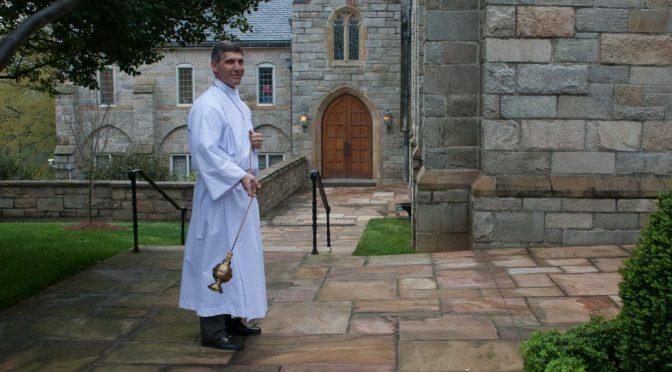 Part 1 of “Wild Water and Full-Body Prayer: Rituals in the Episcopal Church” was taught by the Rev. Darby O. Everhard on Sunday, January 20, 2019. Part 2 of “Wild Water and Full-Body Prayer: Rituals in the Episcopal Church” was taught by the Rev. Sara C. Ardrey-Graves on Sunday, January 27, 2019. “Anglican Church History,” taught by the Rev. D. Dixon Kinser on Sunday, February 17, 2019. “The Book of Common Prayer: History and Theology,” taught by the Rev. John E. Shields on Sunday, March 10, 2019. “The Book of Common Prayer: Practical Use,” taught by the Rev. Darby O. Everhard on Sunday, March 17, 2019. “Stewardship,” taught by the Rev. Sara C. Ardrey-Graves on Sunday, March 24, 2019. “Episcopal Polity,” taught by the Rev. D. Dixon Kinser on Sunday, March 31, 2019. A review and recap of the Episcopal 101 series, taught by the Rev. Sara C. Ardrey-Graves on Sunday, April 7, 2019. Confirmation, Reception, Reaffirmation: Which is right for you? Confirmation is a mature, public affirmation of your faith, celebrated by the prayers and laying on of hands by our bishop. It is a celebration of your baptism and your desire to live out your faith in the Episcopal Church. If you were baptized as a child (in any denomination) but never did confirmation, this rite is for you. Reception is for those who have been baptized and confirmed in a Christian denomination that has a ritual of confirmation (such as Methodists, Catholics or Lutherans) who wish to join the Episcopal Church. Reaffirmation of Faith is for those who have been baptized and confirmed in the Episcopal Church, but in a church other than St. Paul’s. All are welcome to attend any of the classes, but if you wish to be confirmed or received or to reaffirm your faith, you must complete a registration form on or before Sunday, January 27. To register or ask questions about any aspect of your decision to join the Episcopal Church, contact the Rev. Sara C. Ardrey-Graves at (336) 723-4391, ext. 1211, or sardrey-graves@stpauls-ws.org.